The book reviews I did over the holidays (1, 2) were pretty fun to do, and seemed to be of value to some readers, so I've decided to make a book review a regular weekend feature of this blog. 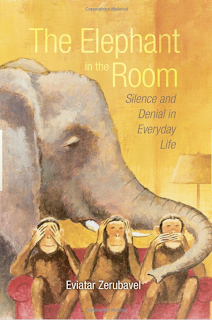 I'll kick this off with a recent read of mine: The Elephant in the Room: Silence and Denial in Everyday Life by Eviator Zerubavel. I bought this because I think the general topic of denial is very pertinent to any discussion of global risks. When something is scary, people have an incentive to somehow avoid dealing with the facts, and a variety of creative strategies are available to them. And in the alternative, if you commit yourself in some way to the idea that a particular risk is a big deal, (eg taking a public position, making career choices based on your assessment), you have a psychological incentive to deny evidence that maybe the problem is not so severe after all. I think it's these dualing incentives that create the structure we so often see around major global risks - one side is busy either ignoring the problem, or if that is no longer working, minimizing it, attacking the integrity of the proponents, etc. Meanwhile, the other side is at risk of exaggerating the seriousness of the problem, ignoring countervailing evidence or important context and of course attacking the integrity of the deniers. Both sides are often sincerely convinced of their own rightness (though there certainly can be scope for cynicism and deliberate dishonesty as well, and both sides will be very quick to point to the evidence for this on the other side, and very slow to examine it on their own side). While it's certainly pertinent to talk about the specifics of denial in the context of energy supply, or climate change, or any other major global risk, I decided I wanted to step back and educate myself more deeply on the overall phenomenon, and what psychologists and sociologists know about it. I think he's clearly displaying some intuitive understanding of how denial and projection work. Still, Freud, as well as his daughter Anna, articulated it more clearly than earlier writers, and it's one of his more important ideas that has stood the test of time. It is still widely used as a framework in understanding addiction and other mental health issues, as well as having become part of daily speech. I personally became familiar with the idea during therapy in my thirties when it became clear to me that there were things about myself that I was systematically excluding from my own conscious awareness without admitting to myself what I was doing. I have a feeling that it's only the process of clearly uncovering some kind of denial of one's own that makes the general phenomenon clear - people in denial about X sincerely believe, at a conscious level, that they are not in denial, and that X is just not true. They don't allow themselves to look at or fairly evaluate the evidence for X. (I think the more recent literature on Confirmation Bias is a closely overlapping area of enquiry). In looking around at Amazon for "denial books", I didn't find much in the way of scholarship on the general phenomenon - there's lots of practical books on denial in addiction. Other than that, I guess we are still in denial about denial... One that did come to hand was The Elephant in the Room by sociologist Eviator Zerubavel which I duly grabbed. I can only recommend it in a fairly luke-warm way. On the plus side, the book is a very easy read - short at only 90 pages of text (plus another 70 of notes, bibliography, and index). It's also very accessibly written, and in general slides down easily, leaving very little of an impression afterward. If you have thought little about the social dynamics of denial, it could be a useful introduction. From my perspective, the most useful thing about it is as an introduction into a larger literature - particularly given the very extensive bibliography. For example, the book has a very small discussion and some references of the issues of denial in the Jewish community in Germany about the Holocaust as it was developing. This is something I hadn't thought about at all, but it seems to be a fascinating and horrible case study of the potential for denial in the face of disaster. Faced with alarming but ambiguous evidence, some Jews fled, hid or rebelled. Most didn't. It's definitely something I want to know more about. When facing a frightening situation, we often resort to denial. In fact, early reports of Nazi massacres of Jews were dismissed by many Jews in Europe as sheer lies. As a result, frightening information often becomes essentially undiscussible. As so chillingly exemplified by the numerous bystanders who silently witnessed the blantant implementation of the "Final Solution," people who live in police states become increasingly reluctant to publicly acknowledge the brutality that surrounds them by discussing it with others. That's it: he moves on. He returns to discussion of the Holocaust another half a dozen times in the book, but always in an equally passing manner. And it's this way with everything - it's not like he just picked other examples to focus on. He never really gets to grips with any historical example in any detail, he never gets detailed about psychological mechanism of denial, he never gets detailed about the sociological literature on denial. So in the end, I am left to pick over the (thankfully extensive) notes and bibliography looking for more satisfying books to order. In this case, The Terrible Secret is on order - I'll let you know how it goes. Thanks for the book review. It's basically about people's tendency towards cognitive consonance and the various reasoning biases and memory failures we employ non-consciously to get there. Such is the nature of the human mind. If you want something more technical (psychology), then I'd recommend Laird's tome, which is a very good overall book into human reasoning. However, it's more than just about denial, mistakes of reasoning and cognitive dissonance. There's also the book by Milburn, 'The Politics of Denial' (MIT Press), but I haven't had the chance to read it yet myself. and, I must admit, cost me a couple of dear friends. set of axioms, which 'I' or any 'believer' considers to be true by definition. These axioms are mostly hidden to the self, because it hurts to investigate them. ..."In this one-off documentary, David Malone looks at four brilliant mathematicians - Georg Cantor, Ludwig Boltzmann, Kurt Gödel and Alan Turing - whose genius has profoundly affected us, but which tragically drove them insane and eventually led to them all committing suicide. ..."
As a personal note, I tried to show my now freshman student-son, what the real perils of a 'life considered' are. Actually 'denial' cannot exist without a 'positive' belief in the first place. One impressive case is Georg Cantor, who studied the infinite because he wanted to find out, what the nature of god was. Look at the other three. Goedel was a Platonist, in that he believed, that there is another realm consisting of pure numbers or mathematical relationships. the agent or subject does not realize in the first place. probabilities, where on the other hand they believe in the 'Singularity'. Ths I find strange and do not engage in any discussions there. Not in the conventional sense. Belief-systems are deductive-inductive, whereby the deductive part is partially obscured. Induction is a method, Deduction is based on a belief(-system). Denial is an unconscious operator (not method, consciously pursued) which conceals the totality of our axioms. If we knew them all, we would be -at least- Buddhists. On a personal level - and this is why I respond to Your post- I actually do not know how to tell my son. It is about the loophole in our predicament, which normally is faked by some silly thesis like Richard Dawkins awe for the 'beauty of existence'. There is no absolute beauty in the world, if ... .
We silly Germans have a wonderful book here: 'Nichts' by Ludger Lütkehaus. 800 pages, just about Nothing. (Addendum: I was just puzzled about 'The Energy Standard team' response. Are You a person? This is silly. There is no weight-watchers group here! This is serious pondering about the human predicament. You pseudo-self-helping Americans are a Joke. Get Your act together or shut up! Sorry Stuart, but people like these would hinder my further commenting. Stuart - I used to read your postings on TOD, and you have no idea how happy it makes me find that you are blogging again. The poster above mentioned Kahneman & Tversky ... I don't know if you are familiar with their research but they did lots of ground breaking research in the wider area of "why people make mistakes in informal decision making", of which denial is of course one part. Energy Standard - thanks for the links! I am familiar at least at a high level with recent work on cognitive biasses, and behavioral economics, but more references is always good. IMO, we deny in order to keep our delusions intact. Why do we hold onto them? Because they are often extremely useful to ourselves and others. I'm with Nietzsche on this. (His influence on Freud was profound). Looking at things from the perspective of a psychologist or an anthropologist, it's often not obvious that truth (strictly construed) is better than falsity. The value of truth in many contexts can be called into question on thoroughly empirical and rational grounds. For a simple example: we lie more convincingly when we manage to believe our own lies. But there are many more... eg. when building consensus, things often move better when people can be persuaded that that their individual interests aren't at risk, even when they are. Datamunger - I'm with you on this. Denial seems to be so universal, that I assume it's a built-in part of the human mechanism, which it turn implies it must be adaptive to have a denial system. I think the reason for this is that some things are so overwhelmingly stressful to think about, that if there's not much to be done about them, it's better not to think about them. One classic example from the psychological domain is that it's common for folks with an avoidant attachment to parents to believe as adults that the parents were perfect, even though the parent was likely very emotionally unresponsive. As a child, "My Mother doesn't love me very much" is so painful and stressful an idea to seriously contemplate, that's it much better to learn to habitually push away the idea and not allow it to enter consciousness. Another interesting book that is only peripherally about denial is "Good Calories, Bad Calories" by the science writer Taubes. He documents the history of the low fab-high carb diet recommendation that has been inculcated into the common "knowledge" over the last 50 years or so. As it turns out, the experimental data doesn't actually commend this type of diet, it may in fact lead to obesity, heart disease, diabetes, and cancer. Yet the researchers so bought into the idea that time after time, when the experimental results contradicted the hi carb hypothesis, they either ignored the data or explained it away. One shocking example was that of a researcher who put a large number of people on a high carb-low fat diet expecting that heart disease would be reduced. It was, slightly, but cancer deaths went up more. He didn't publish, because he didn't like the results. That is quite immoral, to my mind. Yes, I think it's adaptive. Normal & natural. It's the more stunning examples like the one you mentioned that bring this trait common attention. But to be otherwise is to experience The Total Perspective Vortex . Good analysts, I think are a tad masochistic. Where are Chinese Cars in their Oil Consumption? How Much has OECD Oil Demand Recovered? How Long Do Mega-mega-projects Take? Does al-Shahristani Really Think Six Years?